CMP : California Marketplace, located IN THE HEART OF KOREATOWN at the south end of the block bounded by Western Avenue to the West, Oxford Avenue to the east, 5th street to the south and 4th street to the north in the Korea-town District of a Los Angeles, is a three story approximately 127,000 sq foot enclosed shopping mall anchored by the flagship location of the California Market A.K.A. Gaju The G.
Identification of the Property - The subject of this Property is a proposed enclosed neighborhood center located in the Wilshire Center / Koreatown Community Redevelopment Area of the City of Los Angeles, Los Angeles County, California. More specifically, the property has an address of 450 South Western Avenue and an Assessor Parcel Number of 5503-014-020. Legal Description The land referred to in this report is described as follows: Tract Number 1624, exclusive of streets, Lots 1, 2, 3, and 4 and South 10 feet of Lot 36 and all of Lots 37, 38, 39, and 40, in the County of Los Angeles, State of California, as shown in the Office of the County Recorder of said County. -California Market (super market) of retail space (including common areas) oriented toward an interior mall with one tenant space oriented toward and accessed from the sidewalk at the Western Avenue and 5th street intersection. -Loading dock facilities from Oxford. -Coffee bean and Bakery Shop. -Most of the retail tenant space is oriented toward the open mall with the garden concept with some of it oriented toward and accessed from the market space. 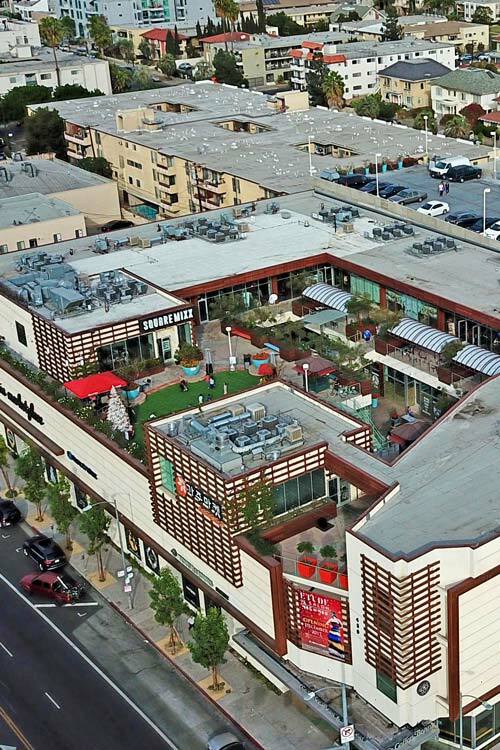 -Since the market is the primary anchor and draw to the center locating it at the ground level will serve to activate the upper levels and bring foot traffic passing by many of the smaller retail tenants. The food court also serves as destination use and its third floor location will also serve to draw customers to the upper levels while allowing it to take advantage of sky lighting to the dining area. Spectacular North Mountain View. -It allows for the convenience of much sought after many level parking that has a view of the sky and the garden for customers. -Access for visitors arriving to the project on foot or by public transportation is located at two locations. There is a grand “symbolic” pedestrian entry under a wide canopy at Western Avenue directly into the 3 story high open mall space. This entry will not only serve pedestrians but will serve as the primary architectural focus to traffic on Western signaling the project. A secondary pedestrian access is provided off of Fifth Street and will be of service to those arriving on foot from the residential neighborhood to the east. -There are two customer vehicle access/egress points. One is at approximately mid block off of Fifth Street and provides access directly to the on grade parking. From the on grade parking a sloping floor system provides access to the below grade levels. The second is off of Oxford Avenue at the north end of the site and provides access and egress via a speed ramp to the below grade parking levels. The direct connection to the street from two separate parking levels will minimize congestion through exiting flexibility and distribution. The Oxford vehicle entry may be closed after a certain time of evening to reduce traffic noise and to the residential neighbors. -Loading access is at the Fifth street vehicle entry, through the ground level parking and to the loading dock. From the loading dock truck trucks will exit directly to oxford always moving in a forward direction without the need back up which would impact traffic flow and create the annoying backup up audible signal. -Up and down escalators continuously link all parking and retail levels. The escalators under the skylights in the mall space will be a focal point and provide a dynamic experience for customers. It is anticipated that most of the market customers will use the escalators for access. -A semi round formed glass feature elevator located at the Western Avenue entry is a prominent focus from both the interior and exterior and serves all parking and retail levels. -One oversized 10,000 pound service elevator with a platform size of 8.5 by 14 feet located at the loading dock will serve all parking and mall floors. In addition to freight it will be used to return shopping carts to the second floor market from the parking levels below. A second service elevator of the same size, also located at the loading dock, is provided for exclusive market use. -Four enclosed emergency fire stairs, one toward each corner of the building provide necessary code required safe exiting. California Marketplace (CMP) Designed By Gruin & Associate Since 1946, Gruen Associates succeeds as one of Los Angeles’ best known legacy firms with a deep portfolio of landmark projects. Building on the trailblazing success of legendary Founder Victor Gruen, we continue to provide creative solutions through superior planning, architecture, retail architecture, transportation planning and design, urban design, interior design, and landscape architecture services. Our impact on the profession and the world continues into the future under the leadership of Managing Partner Michael A. Enomoto, FAIA and his Partners—Larry Schlossberg, AIA, AICP, LEED AP BD+C; Debra Gerod, FAIA, LEED AP; and Ashok Vanmali, AIA. At the heart of Gruen Associates’ leadership group are the “Associates.”Developed over many years, the Associates Group contributes to the strength and capability of the firm. The four partners of today were all promoted from this professional core group. Our success, without question, is also due in part to the dedication of our talented 75-person staff. Quite unique is the level of diversity that has organically been the character and DNA of the firm. Throughout our history, the leaders and staff have worked together with a shared commitment and holistic purpose for our industry, clients and projects.